Day 5: Chicken Soup for the Soul: It’s Christmas! Christmas is an exciting and joyous time of year, a time of family, friends, and traditions. You will delight in reading these 101 festive stories about the joy, wonder, and blessings of the season. 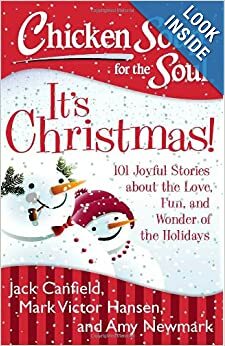 This collection is filled with merry and heartwarming stories about holiday traditions, family, and goodwill. Remember, all of our stories are "Santa safe" so they can be enjoyed by the whole family. A fantastic holiday gift and a great way to start the season! Please make sure to leave a comment for EACH item done. I love a good solid Christmas book! I'd love reading this one. follow Chicken Soup for the Soul on Facebook. follow Chicken Soup for the Soul on Twitter as th7272. Thanks!